Over two hundred people from the Hilltops region and beyond enjoyed a wonderful Sunday afternoon concert recently in St John’s Anglican Church, Young. What a treat with the program consisting of the Hilltops Choir, the Cowra Vocal Ensemble, a duet by visiting Canberra-based artists Rodney Clancy (bass) and George Brenan (tenor), a pipe organ solo by local musician Stewart Bruce and the Young Regional School of Music’s Flute Ensemble conducted by Liz Boland. Hilltops Choir (directed by Rodney Clancy) sang two brackets with some old favourites plus new repertoire, with special mention of The Rhythm of Life and Dies Irae (this from Mozart’s Requiem). 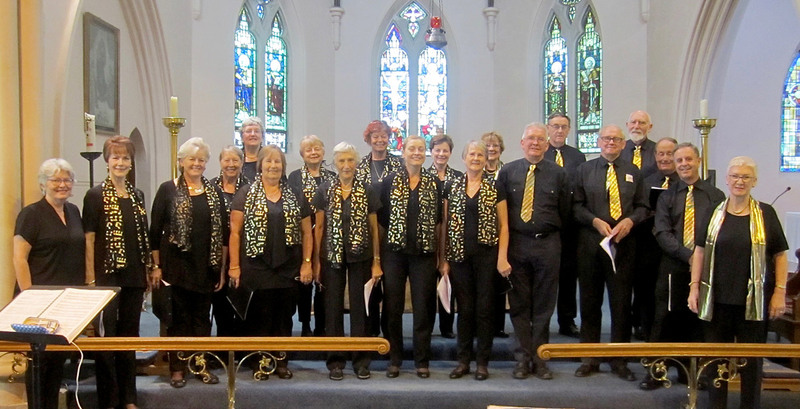 The Cowra Vocal Ensemble of 20 singers entertained with five contrasting pieces, while the six young folk in the flute ensemble presented a string of well-known hymn tunes. Stewart ‘blew the dust’ out of the pipe organ with his take on Highland Cathedral, and the vocal duo gave a moving performance of Lily’s Eyes from the musical/movie The Secret Garden. At the conclusion of the concert, a lovely afternoon tea was had in the church grounds making full use of the fine autumn afternoon. Special thanks go to Hilltops Council for the grant that made this musical event a reality. Thank you also to the Anglican folk who organised catering and to St John’s for providing the venue and use of the pipe organ. For enquiries about the Hilltops Choir, contact Tracey on 0418 672 622, as new members are always welcome!